Tech in Asia? 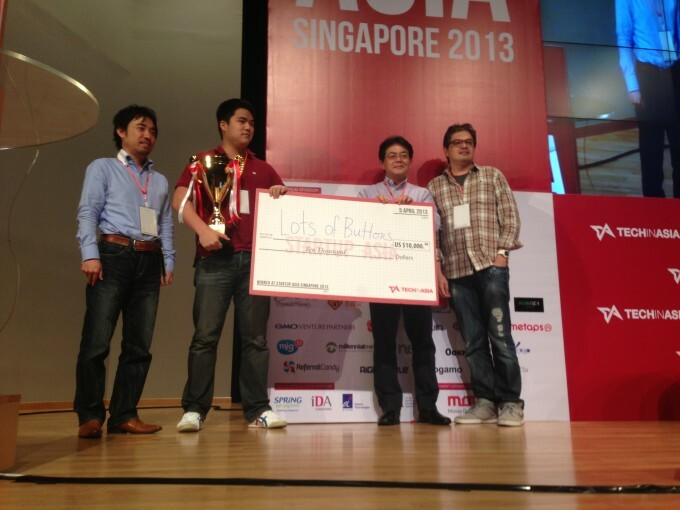 (techinasia.com), an Asia-focused English-language tech blog, announced today that Lots of Buttons has won this year’s?Startup Arena?competition at?Startups Asia Singapore 2013. Lots of Buttons, an ecommerce site which sells just buttons, will take home the grand prize of US $10,000 as well as a fully paid trip to Tokyo, Japan, to attend Global Brain’s annual GBAF. The winning startup also receives a complementary mini booth at?GMIC in Beijing?on May 7 and 8. The Startup Arena competition, part of?Tech in Asia‘s two-day?Startups Asia Singapore?2013?conference, was judged by Andrew Collins (CEO at Mailman Ventures), Jeffrey Paine, (founding partner at Golden Gate Ventures), Nobuaki Kitagawa (CEO at CyberAgent Ventures, Beijing), and Yasuhiko Yurimoto (founder, president, and CEO at Global Brain). A handpicked group of 20 startups were each given a chance to make their pitches to the judges and an audience of investors and other conference attendees over the two-day event. Yasuhiko Yurimoto, founder, president, and CEO at Global Brain commented, ?I think Startup Arena has a very nicely curated list of startups across Asia. It’s definitely a competition startups should join and investors should watch closely.? The 20 startups chosen to compete in Startup Arena are as follows: Netizen Testing, mmixer, Dodohub, Framebench, RichMediaAds, Zocial, Cinammon, Lots of Buttons, Triibe, Xunta, Puddding, Social Agent, Tell My Friends, Social Happen, DealPOS, PixBento, Pombai, 8villages, Hoozin and Shopbust. These startups were chosen by the?Tech in Asia?team from a highly competitive pool of about 300 applications. “One Day Startup Clinic” by JFDI is available in Thailand!